SQUIDALICIOUS: Mother's Day Round Up! 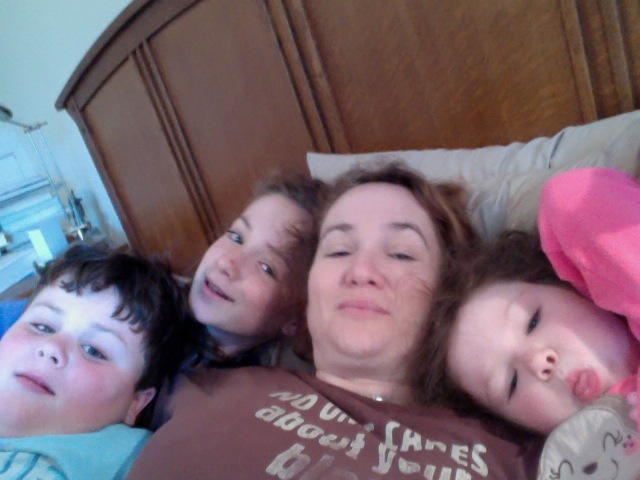 For Mother's Day, Leo ate pasta voluntarily in a fancy restaurant and tackled me for a wake-up snuggle session with his sisters. Gleeful stuff! The girls dressed up and did each other's hair without any prompting or their usual black hole-strength bickering. I don't know what kind of bribes Seymour used to make that happen and empeacen our morning, but I'm grateful. And I was delighted about the North American pitcher plants and sundews Seymour got me for Mother's day! We are now considering going to Butterfly Valley Botanical Area for our anniversary weekend this summer, in the spirit of our honeymoon trip to Gros Morne National Park, Newfoundland. 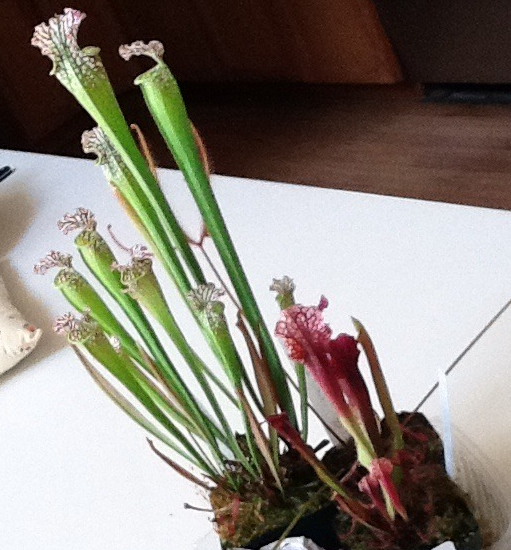 Carnivorous plants rule! TPGA moms celebrated similar moments of maternal pride and delight on The Thinking Person's Guide to Autism Facebook page. A thoughtful person on The Autism Women's Network Facebook page wrote a lovely, appreciated comment about me, sniff (please tell me who you are!). Shannon Des Roches Rosa is another outspoken Warrior Mom who once leaned toward the original autistic community's belief system. In fact, she has chosen to leave all her blog posts up as proof and testament of her evolution along with the understanding she came by after painstakingly forging ahead toward respect with solutions instead of condemnation instead. All for the love of her autistic son, Leo. I finally got time to see Friday's taped episode of The Talk, in which those kind folks cited me as one of their Follow Friday Bloggers. Which was cool, and appreciated as their request came from the blue. And I read Shannon LC Cate's Mother's Day cross/re-post on adoption misconceptions, and tried not too think too much about the fact that my birth son has made his FB page private. Fair enough -- my own FB page is behind a screen, though I recently slapped up a public page for this blog. But the thing is, if my birth son is over 18 and he hasn't contacted me, that means he either knows and isn't interested, or was never told and will never know. Either way, that FB page was my only window, and it's gone. I know I gave up my rights to him when he was born, and the FB page opportunity was a fluke. But, as that other, wise Shannon wrote on BlogHer, "...the fact is, whatever else adoption may be, it is always, always, about grief." True. It's not always in the front of my mind, but it's always there, even though I have no regrets. Happy Mother's day to every kind of mother. I've followed your adoption story with great interest for years. I was adopted, and last year, at the age of 37 found both my birthmom and birthdad. I just wanted to let you see, from an adopted child's perspective, that his reasons for not looking or contacting you are not limited to the two reasons that you mentioned. My greatest reason for waiting as long as I did was b/c I didn't want to hurt my parents. Then there's always the issue of fearing rejection. I also had the thought that maybe, since she never searched for me, she didn't want to be found. So many reasons, and only two people know them. I'd be surprised if he didn't wonder and want to know more. Our reunion has been more wonderful than I could have ever imagined, and my parents took it better than I thought they were capable of. A win win situation for all of us. He's still young so I'd give him some time, but I would definitely recommend contacting him...or putting it out there, at some point in the future. Just my two cents! Happy Mother's Day to you! Hey Shan, the answer to your question is, I. Now get on with your awesome-proper, and continue kicking righteous mama advocacy booty with all the respect your Leo will one day than you for. Lissi, thanks so much, your story made me cry. I guess I'm mostly steeling myself. The best thing to do would probably be to have my mom contact his dad and ask -- except that's scary as hell. Sharon, your comment made me cry, too. Thank you -- and right back at you. So glad to count you as a friend. Shannon - as another adoptee, I'd like to second everything Lissi said. I have known I was adopted from the day I was born. My adopted mother is bipolar, and would frequently bounce between wanting to help me find my biofamily to being devastated that I would even suggest looking. I had many clues, and at 16 actively started searching. I had no luck at all and eventually just stopped searching, although it was always there in the back of my mind. 3 years ago I signed up with an amazing (and free!) group of adoption search volunteers who found my family and made the first contact for me. I kept it hidden from my adopted parents until my divorce last year when my ex called them to throw it in their faces. In retrospect, not my wisest decision, but the emotions of being an adoptee are so complex. I can only imagine the emotions of the birth mother, but it seems to me as though in most cases they are slightly less complex - your thoughts are grief and sadness, but also hope for a better life and placing your child's needs above your own. As an adoptee, the general consensus among my other adoptee friends is that no matter how loving and wonderful your adoptive family, you always feel somewhat unwanted, or as though something is wrong with you that made you unloveable. As an adult it's so much easier to see the birthmother's perspective, but as a child you always wonder. You also have divided loyalties - no matter how much you personally may want to meet your biofamily, you feel so much guilt because you feel as though you are betraying your adopted family, then the feeling of responsibility to them to make sure you aren't hurting them by wanting to know where you come from. Like I said, it's complex. And from what I have found through my own personal experience and also through my friends and the adoption group, most adoptees don't search until later in life, when they are starting families of their own. Hold tight, have faith. Initiating contact IS scary (so scary in fact that even though I've had my biofather's information for 2 years now I still haven't contacted him, and he lives in the next town over), and no one but you an decide if you are ready to take that step. Good luck in whatever you decide! iPad and Autism Workshops - That Work!